It was a memorable weekend of racing at Orcas Island Yacht Club's Round County Race. The event was well organized and a wonderful late season seamanship challenge. The race is arguably more tactically challenging than the Swiftsure and it has three parties! 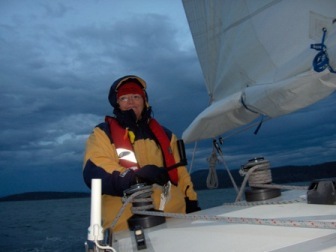 This years race was clockwise around the San Juan Islands. Leg one on Saturday was Lydia Shoal (east of Obstruction Pass) to Roche Harbor. 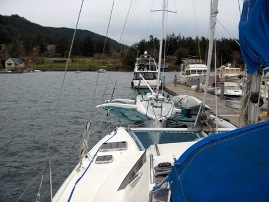 Sunday's leg was Roche Harbor round Stuart and Patos back to Lydia Shoal. Saturdays winds were light. Mustang Sally is pretty sticky in anything under about 6-7 knots of breeze. Our strategy was to get to the half way point (shortened course) before the time limit and hope no one else finished. In an odd way the strategy worked better than we could have hoped. and we were thrown back 3 miles by contrary currents. We did dozens of sail changes and were lucky to ghost our way across the half way point 20 minutes before the 1/2 course time limit. We soldiered on to get within 6 miles of the finish before retiring in the dark with fading winds and a contrary current, 1/2 hour before the time limit. Nine out of sixty five starting boats finished. Sunday looked like a chance for us. The winds woke me, rattling the rigging at 6:00 AM. BIG WINDS predicted. 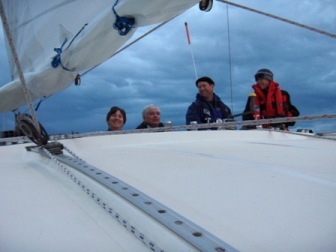 The start is exhilarating - we are barely in control, but the boat is romping with gusto. Winds are 25 knots and gusting and we hoist the small kite right after the start. We are soon reaching and surfing with speed in the 10-12 knot range. Oh so short a reach, until we turn right around Stuart Island and start beating up Boundary Passage under full genoa and reefed main. We set an all time upwind record for Mustang Sally on this leg as we see consistent 9-10 knots through the water. Waves are minimal and Sally is steady in the water, and humming like a freight train. We tuck in another reef as the wind pipes up another 5-10 knots and the Sally maintains her speed. We round the half way point at Patos Island and dive south east for the long beat to the finish. The wind drops to 5 knots south east of Sucia and our hopes for a good finish start to fade. Our tacking angle increases to 125-130 and it feels like we are just crawling. 30 knots to 5 knots - go figger! But the wind pipes up again. It is reefs in and reefs out and reefs back in as we beat our way down the east side of the San Juan Islands. Mark and Dennis are panting from the physical effort of reefing in these conditions. Jan (our novice) is wondering what the hell she got her self into. Sharon and Jola are cool in the rough weather, trimming the jenny to perfection and making quick snappy tacks needing minimal grinding. Around the east corner of Orcas the wind pipes up some more to 30 plus and a reef is tucked back in. The seas are getting really nasty in a wind over tide situation. Big square wave pounding the bridge deck and slowing us down. I decide to reach south westerly trying to use Peapod rocks as a lee, looking for smoother seas and more speed. Mustang Sally responds by hitting speeds in the mid teens. I'm thinking about another reef - but no guts no glory - with the finish line close we let her fly and pound our way to the finish. The crew is ecstatic when we find we won the division. And placing 15th overall is not so bad for a big cruising cat. There was good luck and bad involved, but we ended up winning. 1) on Saturday, the DNF boats were scored one hour after the last boat to finish in the division. 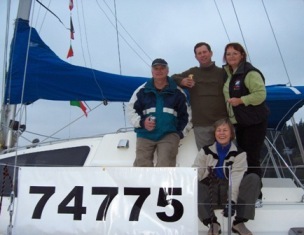 Kim Alfred's Cheekee Monkee was the only boat in our division to finish. A score of one hour behind Kim's radical Corsair F31, on a 30 mile course, in light winds is a steal for Mustang Sally. And it created a tie for second place with all the other boats. 2) on Sunday, Kim was pushing hard and Cheekee Monkee flew off a wave in those big rough waters near the finish and tore off the port ama, making a catamaran out of his tri. So the division started with 3 tris and our cat and ended with 2 tris and two cats. He had to retire. This is a good challenging race. Many thanks to OIYC for their organization and hospitality. Will try and get more IYC boats out next year when the course will be counter clockwise around.